Many parents think their home is the safest place for their children, and this is often true. But sadly, SafeKids.org reports that 10,000 kids are admitted to emergency rooms every day for injuries that commonly happen in homes. Even more disturbing is that, on average, six children die per day in the U.S. from a residence-related injury. At SafeWise, our mission is to provide you with knowledge to help you protect your family. 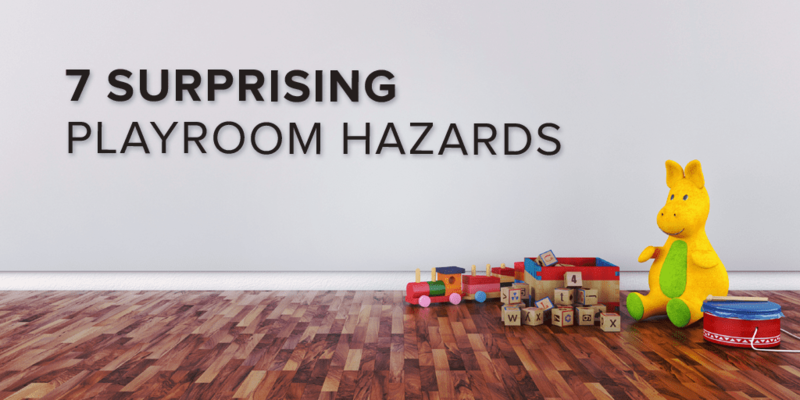 Because children tend to spend a lot of time in playrooms, we researched some of the most common playroom hazards and what you can do to try and avert them. They’re soft and cuddly, but your child’s stuffed toys can also be dangerous. To minimize the risk of suffocation, keep these toys away from areas where your infant may sleep or lay. Babies and toddlers can pull off small pieces — like buttons and eyes — and choke on them, so make sure these are secure on all toys. Finally, stuffed animals can harbor germs and bugs. Wash them regularly, and kill critters like lice and mites by putting them in the freezer overnight. Children can be seriously harmed by accidentally swallowing small magnets. In fact, the U.S. Consumer Product Safety Commission (CPSC) recommends that toys with magnets should be kept away from children younger than six. Search your child’s playroom for these toys, and remove them until your child can use them safely. If your little one uses a foam play mat, make sure it’s safe. Many foam play mats contain formaldehyde and other toxins that could present a health risk to your child. If you can’t confirm the mat’s safety, consider swapping it out with a nontoxic one like the Panda Mat or the Baby Bello Organic Play Mat. An indoor trampoline seems less perilous than an outdoor one, but it is still unsafe. According to the American Academy of Pediatrics (AAP), kids should never use trampolinesunless they are an athlete being supervised by a professional trainer. If your playroom is equipped with a trampoline, give serious thought to replacing it with a less risky toy. From Play-Doh to crayons, glue, and paint, the vast majority of art and craft supplies marketed toward children are nontoxic. However, that does not mean they’re entirely safe. If ingested, even nontoxic supplies can cause side effects like diarrhea, headaches, and nausea. Until your kids are old enough to use these materials properly, consider making safer art supplies from scratch. Choking is the fourth leading cause of accidental death in children under five. A toy small enough to fit through a toilet paper tube or small object tester presents the greatest choking hazard. Dress-up jewelry, toy parts, balloons, and hair clips are common playroom items that should be stored out of your child’s reach until they are at least five years old. Kids’ toys and gadgets often come packaged in plastic wrap, foam peanuts, and other materials that can present suffocation and choking hazards. Err on the side of caution by unpacking all boxes in an area your child can’t reach, and disposing of packing materials immediately. The most dangerous items in your child’s play area aren’t limited to toys. Here are other hazards to look out for, and what to do if you find them. Safety brackets secure furniture — like bookshelves, dressers, and other furniture that can tip over — to the wall. If you can’t secure the item, move it out of the playroom. Dangling electrical cords can increase the risk of electrocution, strangulation, and tripping. Make certain all of the electrical cords in your home are in good condition, and secure them behind furniture or with a cord cover. Each year in the U.S., thousands of kids are injured by falling out of windows. Keep your home’s windows shut, and ensure all window locks work properly. Fix or replace those that don’t, and install a monitored security system with window sensors for added peace of mind. Blind cords are a notorious choking and strangulation hazard, especially for infants and toddlers. Use a blind cord wind up to store excess cord out of your child’s reach, or switch them out for window treatments without cords. Keeping your family safe is a round-the-clock effort. While you can’t safeguard your children from all harm, using our advice may help reduce preventable injuries inside your home. When your kids are outside or away from your residence, consider protecting them with a wearable GPS tracker.